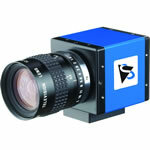 The ST-4000XCM is a new addition to the ST line of self-guiding cameras. 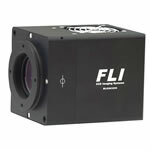 It uses a large 4.2 megapixel KAI-4022CM color CCD previously available only in an STL camera body. 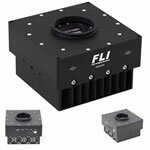 This CCD has 2048 x 2048 pixels at 7.4 microns square. 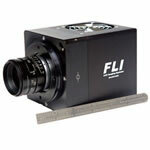 This is the same size CCD used in the STL-4020 camera. The KAI-4022CM comes in a single class without column defects. 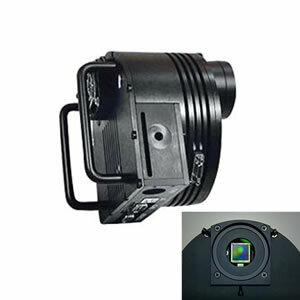 The KODAK DIGITAL SCIENCE KAI-4022CM is a high-performance multi-megapixel image sensor designed for a wide range of scientific, medical imaging, and machine vision applications. The 7.4 mm square pixels with microlenses provide high sensitivity. The vertical overflow drain structure provides antiblooming protection, and enables electronic shuttering for precise exposure control to 0.001 seconds. 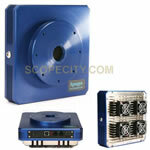 Other features include low read noise, low dark current, negligible lag and low smear. This CCD uses a high gain output amplifier that reduces the read noise by almost half compared to previous versions. 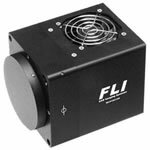 Our preliminary tests of this CCD installed in prototype ST camera body exhibits a read noise of less than 8e- rms and a dark current of less than 0.1e- at 0 degrees C. The KAI-4022CM CCD is a progressive scan detector with an active image area of 15.2 x 15.2 mm. I2C bi-directional expansion port, compatible with the new CFW-10 filter wheel and AO-8. Software Bisque's TheSky version 5, level II, with manual on CD-ROM, full working demo version. 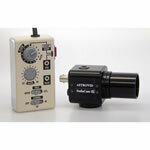 Equinox planetarium and camera control for the Mac (on request with proof of purchase).